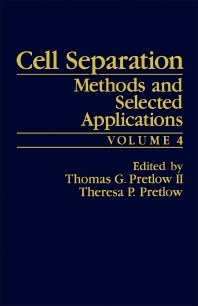 Cell Separation: Methods and Selected Applications, Volume 4 provides information pertinent to the design and application of methods for the separation of cells. This book covers a variety of topics, including liver cells, epidermal Langerhans cells, isolation of oval cells, clonal analysis, and the purification of polymorphonuclear leukocytes. Organized into 17 chapters, this volume begins with an overview of the central role of the liver in the metabolism of the body. This text then provides the analysis of Langerhans cells that allow modulation of their function and provide approaches to the treatment of skin disease. Other chapters consider the biological significance of oval cells. This book discusses as well the elucidation of the mechanisms of cellular proliferation, function, and differentiation in living tissues. The final chapter deals with the important applications of cell culture that involve continuous cell lines. This book is a valuable resource for cell biologists, experimental oncologists, hematologists, immunologists, and endocrinologists. I. Biological Importance of Oval Cells: Does Normal Adult Liver Contain Stem Cells?